Citation: C N Trueman "Henry VIII – the man"
Many in England believed that the succession of Henry VIII would usher in a less austere era than the one Henry VII had ruled over. While Henry VII was seen as being a less than colourful character, Henry VIII was viewed as the opposite and many hoped that the whole royal court would become a more colourful environment. 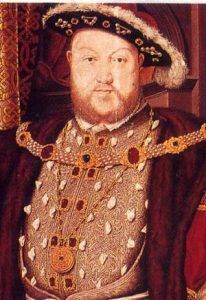 In contrast to his father, Henry VIII was viewed as a man who expected to enjoy himself. He dressed in colourful clothes, enjoyed wearing jewels, ate and drank well and spent money with abandon. Almost as a gesture of how his reign would proceed, one of Henry’s first decisions was to order the arrest of Sir Richard Empson and Edward Dudley – the two men who had been responsible for implementing Henry VII’s financial measures. As a young man Henry had a passion for sport – a passion that continued into his later years but in a non-participatory manner. His greatest love was hunting on horseback, preferably deer or wild boar. Such hunts could go on for hours and were physically very demanding. The young Henry was never found to be wanting. Henry also played real tennis to a very good level. Shortly after becoming king, Henry also took up jousting. Though there was a great deal of ceremony about jousting, the actual joust itself was very dangerous despite the full suit of armour worn by both competitors. Henry continued to joust for 25 years despite nearly being killed on one occasion. Though he was allowed to win by sycophantic opponents, it is generally accepted that Henry had some skill in this ‘sport’. Henry also had a great love of food and drink. He lived in an age when those who could afford to do so, ate in huge quantities. It was a demonstration of your wealth as was a sizeable waistline in your later years. Henry was not unique in having a considerable problem with his weight in his twilight years. Henry liked to think of himself as an intellectual. He believed that he had a quality mind and that he was a true Renaissance man. He surrounded himself with men of intellectual ability – men who could match his own ability. Thomas Cromwell, Thomas More and Cardinal Wolsey were all men of high intellectual ability and it is believed that Henry selected men to work for him only if they matched his perceived ability level. While Henry’s later years and his attitude to his wives have tarnished his reign, there is little doubt among historians that Henry had every reason to believe that he was an intellectual. Clearly his father was a shrewd and intelligent man and it seems very likely that Henry simply inherited this ability. He was not the “universal genius” that Erasmus labelled him but Henry was certainly more than capable of outthinking most of Europe’s monarchs. The only time when he made decisions that history will judge him on (such as putting on trial Anne Boleyn) was when he allowed his emotions to take precedent over his intellectual thinking. What type of king was Henry VIII? What type of person was Henry? A great deal of the evidence from the time is very biased towards Henry – as would be expected – and provides historians with little that can provide them with a full ‘picture’. Was he an overbearing bully of people or a strong leader? Did he abuse his position and authority if he did not get his way or simply act as a king did then? Did he treat people as disposable assets as and when it suited his purpose or, again, was he merely acting as any monarch did then? Was he merely a product of the time and if Arthur had lived, would he have been the same to some degree? If you were brought up to believe that you were king because of God’s will, then can Henry be criticised for what he did to others when he was simply fulfilling the will of God? Some might consider Henry’s seeming bullying of others strong leadership. Such was the complexity of Henry VIII that there is a school of thought that he was a strong, calculating and decisive monarch who built on what Henry VII had bequeathed him. There is also another school of thought that he was a weak and indecisive leader who let others gain far too much power and who had, by the time of his death, squandered what Henry VII had left him leaving a ‘Mid-Tudor Crisis’ for others to solve. Probably, as with so many complex people, Henry VIII was a mixture of both.